Symmetry dictates chemical reactions and drives a number of fundamental scientific levers, including crystallography and spectroscopy. It is one of its most pivotal and central concepts, supporting such physical phenomena as the conservation laws and selection rules that govern the transition of a system from one state to another. 1858 German mathematician August Möbius discovered the topological phenomenon he coined Möbius symmetry– A half-twisted strip with two surfaces but only one side. Scientists have been searching for an example of this in natural materials since It’s discovery without any success. As demonstrated by artist M.C. 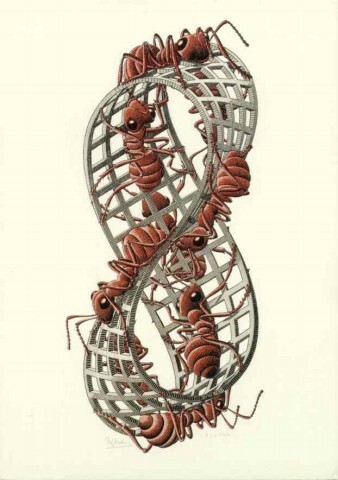 Escher in the composition “parade of ants,” one can negotiate the “inside” and “outside” surfaces of a Möbius strip without crossing over an edge. , a scientist at the U.S. Department of Energy’s Lawrence Berkeley National Laboratory (Berkeley Lab) and a professor at the University of California (UC) Berkeley electro-magnetic Möbius symmetry was successfully introduced into composite meta-molecular systems made from metals and dielectrics. What Professor Zhang’s team have observed through their meticulous studies is a new topological symmetry in electromagnetic meta-material systems that is equivalent to the structural symmetry of a Möbius strip, with the number of twists controlled by sign changes in the electromagnetic coupling between the meta-atoms. 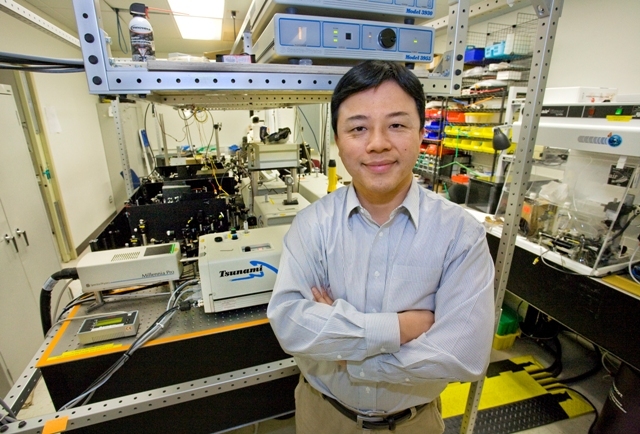 Professor Zhang states that research into this science has further demonstrated that meta-materials with different coupling signs exhibit resonance frequencies that depend on the number but not the locations of the twists. This confirms the topological nature of the symmetry.” This discovery opens the door to finding and exploiting novel phenomena in meta-materials. Configured as coupled split-ring resonators metallic resonant meta-atoms, were assembled into identical trimmers. Through careful design of the electromagnetic couplings between the constituent meta-atoms, these trimers displayed Möbius cyclic symmetry through three rotations of 120 degrees. The Möbius twists result from a change in the signs of the electromagnetic coupling constants between the constituent meta-atoms. “The topological Möbius symmetry we found in our meta-molecule trimers is a new symmetry not found in naturally occurring materials or molecules.” Zhang says. “Since the coupling constants of metamolecules can be arbitrarily varied from positive to negative without any constraints, the number of Möbius twists we can introduce are unlimited. 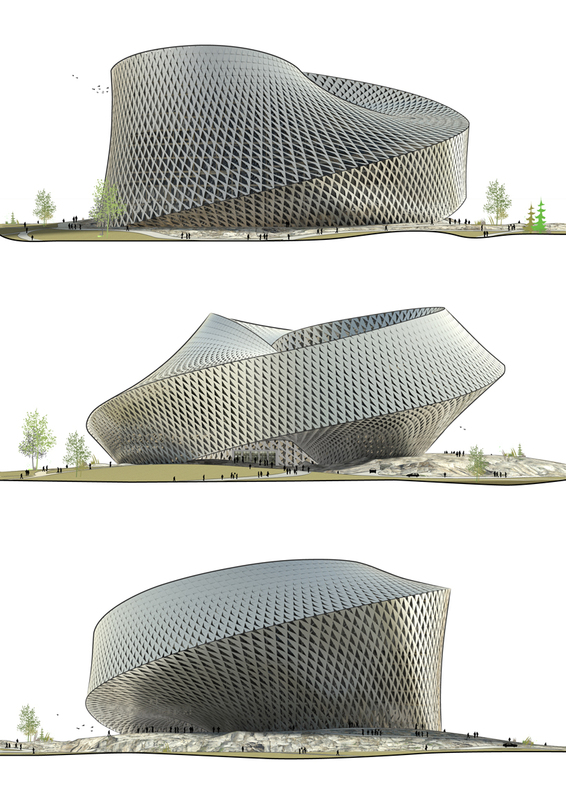 This means that topological structures that have thus far been limited to mathematical imagination can now be realized using metamolecules of different designs.” A perfect example of how the principles of the Möbius strip can be applied to the physical world is in the proposed national library building for Kazakhstan. The outer envelope of the structure surpasses architectural design principles in its relationships between wall and ceiling. The wall becomes the roof which becomes the floor, which seamlessly becomes roof again. Another example of applied principles of the Möbius strip,can be found in Designer Tommaso Gecchelin’s Möbius car. 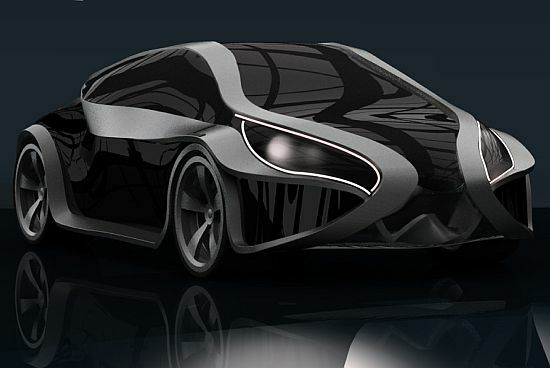 The continuous, bent symmetry translates well to automotive design, and features a body that uses the concept of the Möbius strip to unify the interior and exterior in a unique and uncanny way. The twisting strip that is accessorized with the latest OLED screens wraped around the body further serve to integrate the interior with the exterior by bringing the outside in. NEW NATIONAL LIBRARY; Astana, Kazakhstan; Architect: BIG–Bjarke Ingles Group;Collaborators: ARUP AGU; Client: Kazakhstan Presidential Office.